iWatch concept design by ADR Studios. Apple is secretly building an iWatch deep within the confines of its Cupertino headquarters, according to a new report from The New York Times. The device uses curved glass to bend with the movement of the human wrist. This isn’t the first time we’ve heard rumors of a mysterious iWatch. The Times reported that Apple was prototyping such a product in 2011. But with competitors like the Pebble smart watch starting to ship, the era of the iWatch may be drawing near. Back when the iPod nano was generating buzz for its usefulness as a digital watch face, Bilton heard that Apple was “conceptualizing and even prototyping some wearable devices.” An iWatch would interface with an iOS device like an iPhone or iPod touch. What Apple is working on could very well use Corning’s flexible Willow Glass, according to today’s report. Corning’s Gorilla Glass is currently used in Apple’s other iOS devices. Willow Glass is super slim and capable of bending around a surface. An iWatch would presumably use Bluetooth 4.0 to connect with an iPhone and show incoming messages. The device would ideally have a small display and be more of a bridge device. 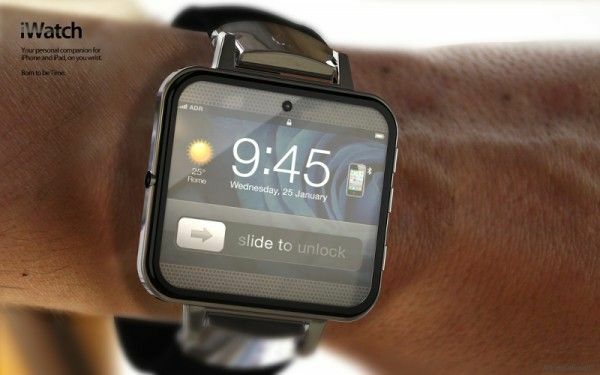 The founder of Apple’s Human Interface Group has proposed that an iWatch would rely heavily on Siri. You could ask your watch to tell you the weather, answer a call on your iPhone, reply to a text message, pay with Passbook, and make appointments. There’s no ETA on when the iWatch will make its debut. It sounds like Apple has found a new product category to revolutionize. Apple Inc. is experimenting with designs for a watch-like device that would perform some functions of a smartphone, according to people briefed on the effort. The company has discussed such a device with its major manufacturing partner Hon Hai Precision Industry Co., one of these people said, as part of explorations of potentially large product categories beyond the smartphone and tablet.